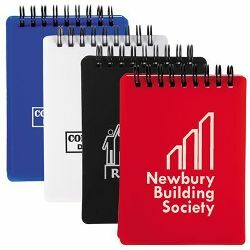 Pocket notebook with 70 sheets of top spiral bound lined paper with perforations.Robust cover. ITEM SIZE(MM) 93L x 135H. PRINT AREA(MM) 70L x 80H. COLOURS Red, Blue, Black, White.